The University of Illinois has been named a "Top Producer of U.S. Student Grants" for eight of the past nine years. This scholarship is for 1 year of study or research in any country where there's a Fulbright Commission. Some shorter term and English teaching programs are available. While most Fulbrights are available to any country in any discipline, there are also a number of discipline-specific awards offered. Seniors, graduate or professional students, and graduates are eligible to apply. You must be a U.S. citizen. Meet some recent Fulbright applicants: Rosalie lerardi, Joe Johnson, Sammi Wong, Matt Grobis, and Tiffanie Bui. The selection committee rates candidates based on their academic or professional qualifications (especially in relation to proposed projects), the validity and feasibility of the proposed project, language qualifications, evidence of maturity, motivation, adaptability to a different cultural environment, knowledge of the host country, and the impression a candidate will make abroad as a citizen representing the U.S.
Former applicants Tiffanie Bui, Rosalie Ierardi, and Matt Grobis discuss qualifications for the Fulbright grant. Fulbrights are more than academic awards; Fulbright commissions look for extracurricular activities in and out of an applicant's field, leadership potential, and general community involvement. Specific criteria pertaining to your country may be found here. Multimedia presentations and interviews of past recipients are available on both iTunes (free subscription for “Fulbright Program”) and YouTube. Read more about recent Illinois Fulbright Scholars. The University of Illinois has been named a top producer of Fulbright recipients for eight of the past nine years. If you would like to follow up on any of the information presented, please contact the NIS Program to schedule an appointment or email us for materials from our workshops on personal statements and research proposals. Students are encouraged to submit a priority application for the Fulbright Grant. University faculty and staff who are familiar with the Fulbright will review materials received by this date, while only the National and International Scholarship Program (for graduate students, the Graduate College Office of External Fellowships) will review materials submitted after this date. In either case, we will provide feedback on multiple drafts of your application both before the priority deadline, and from the priority deadline to final submission. A signed Scholarship Waiver (either scanned or in hardcopy). A complete Fulbright Application, submitted online through the Fulbright site, including a personal statement, statement of proposed study or research, and uploaded transcripts from all colleges attended. However, no other supplementary materials or foreign language reports are needed at this time. Three letters of recommendation, submitted online through the Fulbright site. For Research Grants, letters should be primarily academic but cover all areas of what Fulbright is seeking (tips for referees are available here). For Teaching Grants, referees are asked to fill out an online form detailing your potential as an English teacher in a foreign country (tips for referees are available here). Choose referees based on the questions asked! Please inform your referees of internal Illinois deadlines, as only the national deadlines are displayed in the online forms. Receive further information about priority deadline requirements. 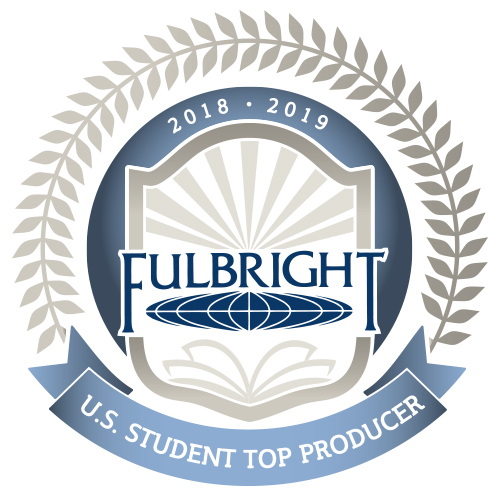 Whether or not you turned in a priority application, a complete Fulbright application must be submitted to us in order for you to be considered for a Fulbright. Fulbright requires our campus to review and rate all applications. This rating goes forward confidentially with your application. Thus, it's extremely important to turn in a polished application for the campus review committee by this date. Although you may have the option of revising your application based on this committee's feedback, the campus committee's ratings will not change. The committee will consist of university faculty and staff who are familiar with the Fulbright Grant, the geographic region of your application, and your general field. The committee will evaluate your application based on a review of your materials and an interview (often testing requisite foreign language skills). Regardless of the rating you earn from the campus committee, all applications are forwarded to the Fulbright Commission (however, lower rated applications rarely receive much attention at the national level). Click here to obtain an idea of the types of questions your application should address and that may come up in an interview. A signed Scholarship Waiver (if not submitted since July—either scanned or in hardcopy). Three letters of recommendation, submitted online. Please inform your referees of internal Illinois deadlines, as only the national deadlines are displayed in the online forms. A complete Fulbright Grant application, including application form, statement of proposed study or research, personal statement, uploaded transcripts, foreign language report(s) (if required), and any letter(s) of affiliation or acceptance for research or university coursework (not needed for ETA grants). Supplementary materials, only for candidates in the arts or creative writing, uploaded to the Fulbright portal. The applicant must submit the complete Fulbright application electronically with any final revisions by this deadline. Arts candidates also need to upload their sample materials. Additionally, you will need to ensure that all letters of recommendation specifically tailored toward your application as a Fulbright Scholar are submitted online by this date. Note that references for English Teaching Assistantships require a different form than those for other research or study awards. Research or study grant letters should be written to the attention of the "Fulbright National Screening Committee." An applicant pursuing a Fulbright Grant to undertake research or coursework at an overseas university also must mail his or her admissions application to the university of choice by the admission deadline for that institution. In late January, students are notified if their application has been recommended for forwarding by a national panel to the various in-country panels. The in-country panels then review the finalist applications and further narrow the field. A select few countries conduct telephone or Skype interviews of finalists, usually by early April. We will coordinate mock interviews for those students called to an interview. Students are announced as recipients, alternates, or nonawardees between March and June. Once a Fulbright is awarded, IIE will put recipients in touch with returning Fulbrighters upon request. Also, recipients may obtain copies of midterm and final reports of previous winners. Recent Illinois Fulbright applicants share tips on applying. Winning Fulbright applications from Illinois are available for viewing at the office of the National and International Scholarships Programs in our library. Your personal statement should be an intellectual biography. The instructions are not totally correct—that is, they really are more interested in your intellectual development than in knowing that you are the third child of divorced parents, unless of course you are studying the affects of divorce on children. You should also demonstrate a clear commitment to and description of how you will engage with the host country community. Approach your statement of proposed study or research like a newspaper article (answer what, where, why, and how). Create an introductory paragraph that briefly summarizes your proposal, and then go on to further explain. Do not use discipline jargon, as most reviewers will not be familiar with your area of study. For students who are just completing their undergraduate degree, many country Fulbright programs allow them to do coursework at a university with a smaller research component. In this case, your statement of proposed study or research should discuss the types of courses you would like to take and how this coursework fits in with your future plans. Those who are applying for teaching assistant positions should focus on portraying why they would like to undertake a teaching assignment (what you will gain from teaching and being in that country), experiences they've had relating to the overseas assignment they are seeking (how you will contribute), how they will use the experience upon returning to the U.S., and how they will spend their time abroad outside of the classroom. The last paragraph of all proposals should include the duration of your sojourn and date of departure. Letters of recommendation should focus more on addressing the applicant's proposal and less on past achievements. For letters of affiliation, use your current academic and professional contacts to assist you in finding an affiliate for your research project. A Worldwide Colleges and Universities database may also prove helpful. Contact the Scholarships Program for additional advice on locating potential affiliates. In the "Host Country Engagement" prompt, they are really looking for how you plan to meet people from your host country outside of your project. If you studied abroad previously, include the institution(s) where you studied abroad in the "Academic Information" session. If your study abroad courses and grades are not listed on your U.S. transcripts, you need to obtain transcripts from the overseas institutions as well. Letters of placement or affiliation should address the feasibility of your project and whether or not appropriate facilities are available. A Foreign Language Report should be completed both for the foreign language required by the country AND any other language needed to conduct your research or project. We need these completed online prior to August 26. For students applying in the arts, the supplementary materials are vital—even more important than the paper application. For official information on the Fulbright Grant (which supersedes any information provided here) and access to the online application, please visit their website.